"You sure have good hygiene"
Every once in a while, when my husband and I have a disagreement, we attempt to turn it around to something positive by forcing ourselves to give each other one "real" compliment. But that sometimes deteriorates because, in our anger, we can't think of one lovely thing about the other person to say other than "Gosh, you sure have good hygiene". And sadly, sometimes that isn't even true! So, since at the current moment I'm not even slightly angry at anyone, I thought I'd take the time to say much more than one thing nice about my husband. Recently I am on a quest to honor him and show him the respect he so deserves. So here it is. A real list. No hygiene comments to be found. Just true, honorable things. He’s a great Dad. He’s always looking for ways to guide our kids into adulthood successfully. He looks for lessons and moments of teaching and he does it in a very caring way. He’s also never lost his sense of fun. He likes to play with the kids and they cherish their time with him. He’s a great provider. I never have to worry about food, shelter, clothing, or heat. We are well taken care of. We even have extras for vacations or the occasional remodel here or there. And it’s not just about our current financial status. If we suddenly got hit with an unexpected financial drain like hospital bills or the loss of his job, I know that he would do everything in his power to step up to the plate and provide even if it meant he worked his fingers to the bone at some manual labor job day and night. He takes his provider role very seriously and I respect his work ethic. He’s willing to help me when I am overwhelmed with responsibilities. Most times I can handle the day in and day out of being a wife, mother, bible study leader, etc. But there are times when something comes up demanding my time and I need help. If I give him clear directions of what would help me most, he’s always willing to try and help out. He’s very gifted when it comes to art. 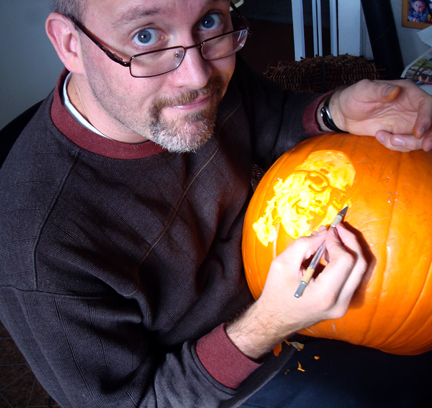 How many men can blow glass, make pottery, make arrowheads, do wood carvings, and carve amazing Halloween pumpkins that people come far and wide to see? The list goes on and on. He’s got both the visual and manual skills of a real artist and it’s very impressive. I love when people come over to the house for the first time and I can show off the glass blowing he’s done and talk about how talented he is. He’s a good cook and fearless in the kitchen. Not many men would take on cooking almost everything for a Thanksgiving feast at a moment’s notice when things went awry at a family gathering. But fear not. When things go wrong in the kitchen, John is calm and collected and completely ready to tackle any task without complaining and without making others feel ashamed at their struggles. He’s responsible with money. I can trust him to invest our money safely and to spend it frugally. He’s not an impulse buyer either. I have no fears that he’ll run out tomorrow and buy a speed boat. No, even small purchases made by him are carefully thought over and planned out. I think this one might go hand in hand with how good of a provider he is. He loves God. This is our common compass with which we direct our family decisions and it’s immensely important. Whenever we come to a place of disagreement, I take comfort in knowing that he is guided by the same God as I am. He’s a great gardener and we get to enjoy the fruits of his labor. This is amazing to me because I doubt I could even keep a plant alive. But John has herbs and veggies growing in the summer and a full winter crop of kale in the winter. He toils away at it and it’s like having a produce section in my back yard that I did nothing for but partake in. He spoils us in this regard. He encourages me in my endeavors. When I suddenly take on teaching a bible study lesson, singing at a Christmas brunch, or designing a Neurologists new website he’s my biggest fan. He listens to my process, my thoughts, my planning, and my fears. I babble on and on many times and he hangs on for dear life but still tries desperately to support me in it because…he cares. And that’s probably the common thread to all 10 things on this list. John does all these amazing things because he cares.